The dome has today been installed on the containment building of unit 3 at the Fangchenggang nuclear power plant in western China. 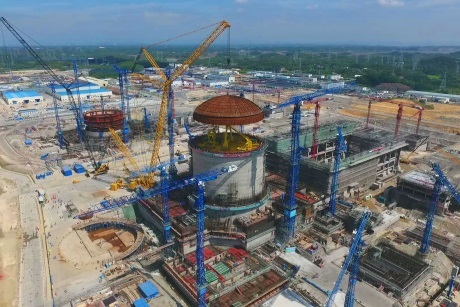 The unit is the first of two demonstration Hualong One (HPR1000) reactors being built at the site in the Guangxi Autonomous Region, about 45 kilometres from the border with Vietnam. The steel dome - measuring 45 meters in diameter and almost 14m in height, and weighing about 260 tonnes - was raised to a height of 63m before being lowered on to the top of the containment building walls. The dome is made up of embedded parts, steel plates and welded corner steel, said China General Nuclear (CGN). There are safety and control systems installed within the dome, it added. "Exceptionally high technical standards are a prerequisite for prefabricating and assembling the dome on the ground before lifting," it added. The company said it had used "innovative three-dimensional modelling and other intelligent nuclear power construction technology to simulate the dome lifting, allowing it to predict the challenges and formulate solutions to ensure the accuracy, safety and success of the dome lifting in practice". First concrete was poured for the nuclear island of unit 3 of the Fangchenggang plant - 39% owned by Guangxi Investment Group and 61% by CGN - in December 2015, while that for unit 4 was poured a year later. Unit 3 is expected to start up next year, with unit 4 scheduled to start up in 2020. Construction of two Hualong One units is also under way at China National Nuclear Corporation's Fuqing plant in Fujian province. Those units are also expected to start up in 2019 and 2020. Two HPR1000 units are under construction at Pakistan's Karachi nuclear power plant. Construction began on Karachi unit 2 in 2015 and unit 3 in 2016; the units are planned to enter commercial operation in 2021 and 2022. The HPR1000 has also been proposed for construction at Bradwell in the UK, where it is undergoing Generic Design Assessment. The Office for Nuclear Regulation and the Environment Agency announced in November last year the start of the second, technical, phase of the assessment programme for the UK HPR1000. CGN UK CEO Dongshan Zheng said, "The announcement today shows the very positive progress being made at Fangchenggang unit 3, and illustrates once again our expertise, as the world's leading builder of nuclear power stations, in project management, engineering and construction of new reactors." He added, "This milestone for the HPR1000 technology is also great news for the Bradwell B project, showing that CGN will have a track record in safely and efficiently building and operating this type of reactor well before the project becomes operational in the UK."